When I started Gretchen Rubin's bestselling book The Happiness Project, I went into it knowing I would find it inspiring (I mean, just look at the title). But I had no idea just how inspiring it would be. Barely two pages into chapter one, I knew that I had rarely--if ever--read a book more perfectly suited for my current state of mind. 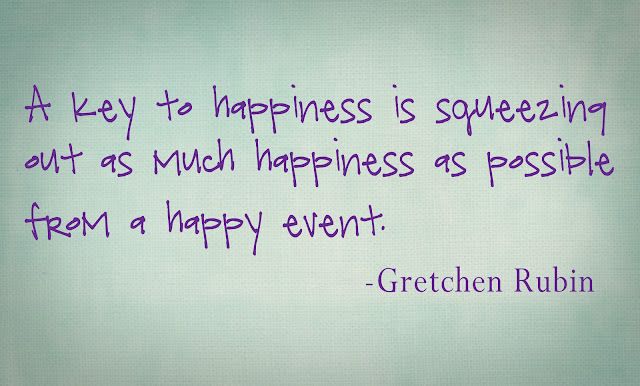 For Gretchen Rubin, the idea of a happiness project was born while sitting on a bus. She decided that while she would call herself happy, there was no reason she couldn't try to be happier. This simple concept led her to evaluate her life in order to find ways to make herself happier without changing anything big. She had a job and a husband and children, so she couldn't just take a month-long hiatus; and she, admittedly, didn't like change, so she wasn't about to just stop her normal routine and do something completely out of character. So began a year where she made a new resolution each month--a resolution that attacked an aspect of her life she wasn't completely happy with: energy, marriage, friendships, passions, and so on. As I went through her resolutions and read about the things she worked on to make herself happier, I realized this: that I had, unknowingly, already been working on my own happiness project. Being off work was a happy event, but I knew if I wasn't careful, I could easily sit around watching TV for 14 days straight and at the end of it feel out of shape and unaccomplished. Instead, I made a list and used every day efficiently, which I know doesn't initially sound like much fun, but for me it was the difference between insane boredom and being able to truly enjoy my time off work. This hit on a trait I've already realized about myself: I like productivity and efficiency. They make me happy. 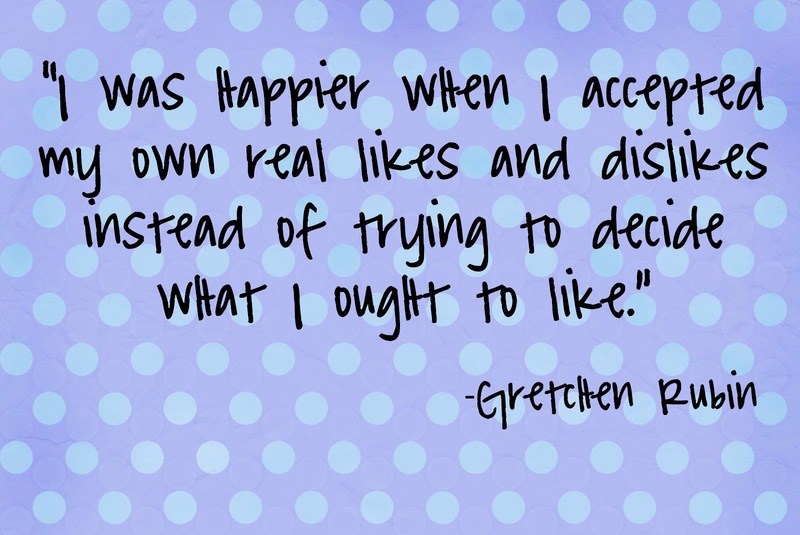 At the start of her happiness project, Gretchen made what she called her "ten commandments" of the project. One of them was to "Be Gretchen." Essentially what she meant was that she wanted--needed, rather--to find her passions and embrace them. What she liked wasn't always going to be what someone else liked, and that was okay. To some degree I have trouble with this. I want to like everything and be part of everything, but there are just some things I don't like, and part of being happy is recognizing that and not forcing yourself to do things you don't like. To me this means saying no. I don't have to say yes to something if I really don't want to do it. I need to spend my free time doing things I want to do. Of course there are exceptions to this, but it's a good rule to keep in mind. I'd say over the past few years I've been more and more trying to embrace me and not let other people make me feel silly for being myself. I was telling a friend about this book, and she wondered if it might get boring reading about 12 months of someone else's resolutions. Admittedly, in the last few months (of the book) I wasn't reading as intently or writing down as many quotes. I think that's because some of her resolutions are going to fit one person more than another, and all of my favorites were in the beginning. But I would most certainly read this book again, and I honestly cannot think of anyone who wouldn't benefit from reading it. There's a lot more I could say about The Happiness Project. I had a difficult time even writing this review because I couldn't narrow down the list of things I wanted to talk about. Always complete a task that will take you less than one minute. Put away the Scotch tape, return your shoes to the closet, and place that bowl in the dishwasher. This will keep small tasks from piling up and taking ten times as long later on. If I'm feeling grouchy, acting grouchy will only exacerbate that. I should do my best to act happy and therefore become happy. Sometimes I get annoyed for no reason, so hopefully acting not annoyed will help get over being annoyed. This doesn't work all the time, obviously, but I'm going to do my best to give it a fair try. One of the things I appreciated and enjoyed about this book was the research Gretchen weaves throughout the text. She read a number of books on happiness and includes interesting facts that are relevant to the particular resolution. I learned that six seconds is the minimum amount of time necessary to promote the flow of oxygen and serotonin—mood-boosting chemicals that promote bonding. So I've decided that when Jordan and I are upset with each other, I'm going to try hugging for at least six seconds. Maybe a few extra seconds will help lift the mood. One thing Gretchen talks about is being ready for the storm when it comes. I know that someone might read this or any other post on this blog and think, Well what do you know about being unhappy? You have a great family and a husband and a good job. 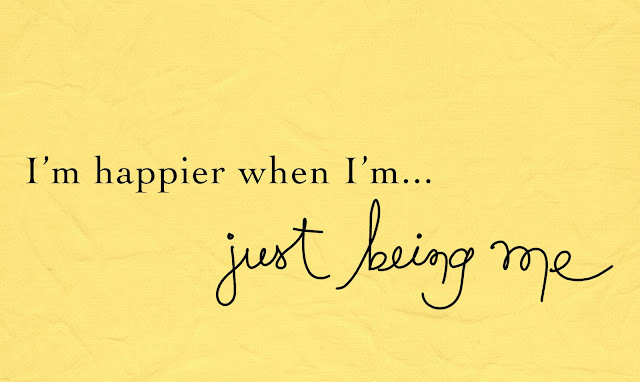 Why do you need to work on being happy? Well don't be fooled. I have many struggles, personally and professionally and with all of my relationships, including my marriage. What I appreciate is that in her book, Gretchen asks herself this same question. The reason why we need to work on happiness now, she says, is so when we are faced with times of unhappiness, we will have already been practicing happiness. And so the people we've made happy with our happiness will be ready to lift us up as well. Jordan even said that he feels like my period of being so down and negative has actually helped him learn to be more positive--an unexpected yet encouraging result. So read this book. There's a lot more good stuff I didn't even mention here. And comment below if you'd like with some things YOU do to make yourself happier. I've been wanting to read this book and now I'm going to for sure. Love all these tips and I loved what you added at the end about the difference between happiness and joy! Amen sister.